‘German military figures had a certain terrifying glamour,’ wrote Patrick Leigh Fermor, recalling views about Germany during the First World War. When, he asked, had the bristling general replaced the ‘philosophers and composers and bandsmen and peasants and students drinking and singing in harmony?’ The enchanted forest, symbol of Romantic idealism and traditional folktales, had given way to other images of Germany and Germans. By following Leigh Fermor, and over eighty other British and North American literary visitors to Germany, this original anthology shows how different generations of English-speakers have depicted this country. Starting in the sixteenth century with some of the earliest travel accounts in English, Brian Melican presents a wide range of writing about, or set in, Germany. 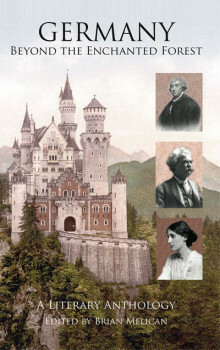 Letters from Johnsonians such as Boswell and Garrick and the Romantic poets Coleridge and Wordsworth; the journals of Herman Melville and Henry James; ante bellum fiction by authors such as D. H. Lawrence and Ford Madox Ford: all of this and more reveals an oft-forgotten richness in encounters with Germany before the horrors of the twentieth century. Work by Christopher Isherwood, Stephen Spender and wartime reporters through the 1940s exposes the country’s darkest moments, while sometimes surprising takes on the conflict emerge from authors inside Germany with unique perspectives such as Christabel Bielenberg and Michael Howard. Post-war writing ranges from the spy fiction of Len Deighton to the writers who dissected post-Nazi Germany. The diversity of writing about Germany today encompasses light-hearted accounts and more searching passages taken from an eclectic selection of authors. Recorded and imagined images of Germany have changed dramatically across the centuries. Yet views on many of its features especially its cities and rivers, customs and cuisine have often remained constant. This anthology, with extensive introductions and annotations, offers a range of opinions, both typical and atypical of their time, and invites readers to venture beyond the usual discussion about this country at the very heart of Europe. Brian Melican is a British journalist, translator, and author who has been living in Germany for five years. He has published a range of articles, online videos and books in English and German.